1. How to make use of the card Context menu? The card Context menu provides quick access to many functionalities in the software. To open the Context Menu, please right-click on a card. Comment – this is a shortcut to the Comments tab of the card where users can review/edit/create a task-related comment or mention another user in Kanbanize. Subtask – this is a shortcut to the Subtasks tab of the card, where users can create/edit/delete subtasks or checkmark finished ones. Link/Copy – allows users to create a hierarchy and order between new and existing cards via parent/child/relative/successor/predecessor relation. With the "Simple Copy" option, you can easily create a card copy. Permalink – use it to copy the unique card URL for reference. Just click the Permalink and then use the keyboard shortcut to paste it. Watcher – watching cards allows users to receive notifications for any changes that have been made on a certain card, even if you are not subscribed to get notifications from the board where the card is located. From the card Context menu, you can only assign yourself as a card watcher. If you want to assign a different user, please use the feature from the Card fields section. Log time – users can log time at a card or subtask level. Assignee - use this shortcut to quickly assign cards without opening them. Color - use this option to change cards' color. Deadline - set up a deadline for the task from the calendar picker. Priority - select/change card priority. Size - input card size value. Tag - input a tag value. 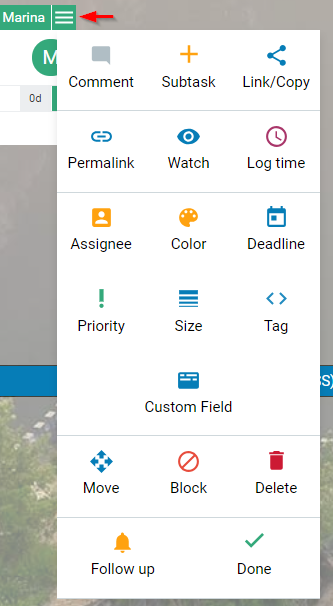 Custom fields - set/update/remove custom fields. Move – move the card horizontally between columns (left, right) as well as vertically in the column itself (top, bottom/ up, down). The “Move to” option allows you to move cards across boards and projects. Block – block a card and make it immobile unless being unblocked. Delete – allows you to delete a card from the board. Follow up – allows you to set up a reminder and follow up on the card within 5,15 or 30 minutes /1, 2 or 4 hours/ a selected date from the calendar. Upon deadline expiration, a reminder pops up on your board and the system sends you an email notification. Done – select it to directly move a card into the Done column. How to configure your card view?